Like the LED bulb that is now permeating the market, so has virtual reality been around for decades—in one form or another. And true to the seemingly universal rule of thumb that dictates that anything legitimately cool we see on TV eventually makes its way into our home, so have virtual reality headsets been trending up. 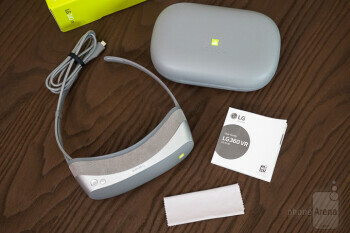 Headsets, such as the LG 360 VR. 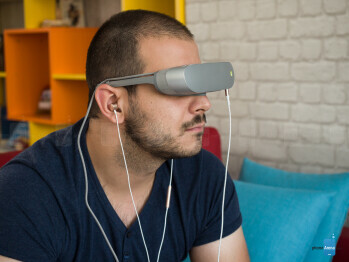 Priced at $199 in the United States, and with a rather underwhelming initial showing during MWC 2016, we were curious to see if the final product is worth the price tag, if it's effective at drawing people to virtual reality, and if its promise of "smartphone-free" viewing would amount to something truly noteworthy. Dozens of VR headsets have made their way into the wild already, but universally, you look like a fool with them glued to your face. The time will come to try and work on making these aesthetically pleasing, but it is not this day. For its part, the LG 360 VR looks better than most, with noticeably smaller physical footprint and back and select buttons on the top right. 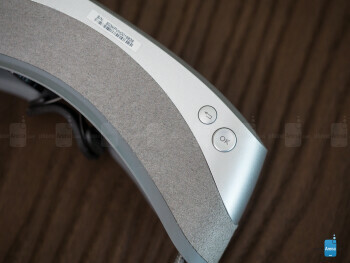 The headset is the size of a phablet in width, and half that in height, weighing just 4.7 oz (134 g). In comparison with, say the Samsung Gear VR, it's significantly more compact, lighter, and travel-friendly. Ergonomics with the LG 360, however, are actually worse—and that's saying quite a lot as Gear VR users will know. 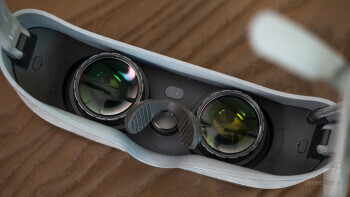 Quite frankly, it's shocking that the one standout feature of LG's VR headset—its lightweight and compact construction—is undermined by the seriously uncomfortable eyeglass temple. How this passed the internal OK is beyond us, as it literally cuts into the top of your ears. Beyond that, the LG 360 VR is actually light enough as to be comfortable to use even for longer stretches. The nose pads are also comfortable and can be regulated, unlike OnePlus' Loop VR. Of course, given how the LG 360 VR needs to be tethered to a _phone_ (via a rather short USB Type-C cable), and with the addition of earbuds, it all quickly escalates into a tangled mess where accidental damage to your smartphone is not at all unlikely given how much you'll be looking around. That said, it is because of that tether that the LG 360 VR is light and compact—the _phone_ doesn't have to sit on your face. Instead of that, LG has integrated a tiny, 1.88”, 960 x 720 pixel resolution IPS LCD display that's used for viewing. With such a high pixel density, we were actually pleasantly surprised to note that image sharpness was better than the Gear VR paired with the Galaxy S7. 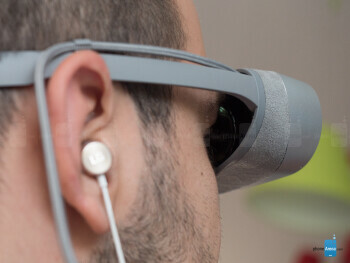 To focus the lens, you twist them until you're satisfied, but you can only do so with the so-called Light blocker part of the headset removed first. Not only is this extremely annoying, as you'll likely want to do some finer adjustments after your first attempt, but the light blocker isn't much of a light blocker anyway. Indeed, light seeps in from the bottom and even the sides, creating a distracting glare on the lenses' glass. Overall, the 360 VR feels all kinds of half-baked. The construction isn't as solid as we'd expect, and the headset raises some extremely valid concerns when it comes to comfort and even practicality. Beyond that, the LG 360 VR is actually light enough as to be comfortable to use even for longer stretches. 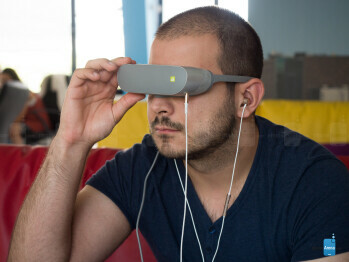 The nose pads are also comfortable and can be regulated, unlike OnePlus' Loop VR. Of course, given how the LG 360 VR needs to be tethered to a phone (via a rather short USB Type-C cable), and with the addition of earbuds, it all quickly escalates into a tangled mess where accidental damage to your smartphone is not at all unlikely given how much you'll be looking around. 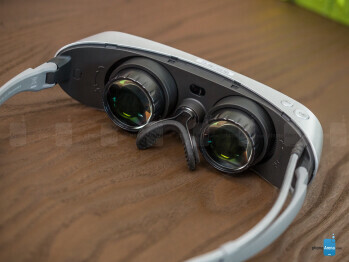 That said, it is because of that tether that the LG 360 VR is light and compact—the phone doesn't have to sit on your face. Instead of that, LG has integrated a tiny, 1.88”, 960 x 720 pixel resolution IPS LCD display that's used for viewing. With such a high pixel density, we were actually pleasantly surprised to note that image sharpness was better than the Gear VR paired with the Galaxy S7. To even use the LG 360 VR, you'll need a smartphone with a USB Type-C jack, and those aren't exactly common right now. Past that, tethering your phone to the headset ought to do the work, though in our case it didn't—we had to manually select the USB connection type to File Transfer (an Android Marshmallow thing). Once that has been done, the phone should prompt you to download the 360 VR Manager app, along with a few other essentials such as 360 VR Gallery and Video, and some third-party titles. After that, an interactive demo will play, walking you through the basics and the various ways you have to control what's happening on the screen. Every time you connect the LG 360 VR to your smartphone, you'll be transported to what LG is calling 360 Home. 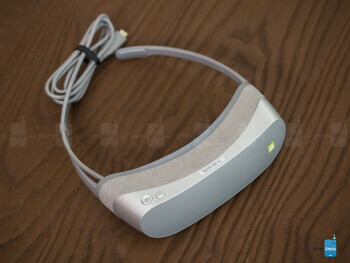 In there, by moving your head and aiming at certain apps, you can select them via the physical keys on the headset. There are just two backgrounds available for your virtual reality 'home': an authentic, office-like area, and just a random, colorful world of... well, nothing but colors. 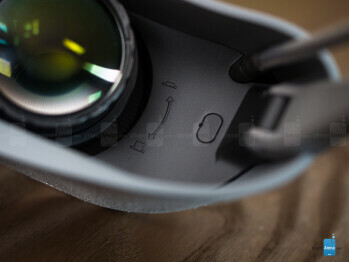 Perhaps the best thing about LG's 360 VR software is the ability to re-center the interface. The lack of this feature with other VR headsets has proven an issue, as the various gyro sensors in them eventually make enough computational errors as to force you to crane your neck or re-position entirely in order to see the heap of the battle, instead of the sidelines. The LG 360 VR is costly. The LG 360 VR is shockingly uncomfortable to wear. The LG 360 VR means a world of horror due to the many cables sticking out of it at all times. But none of these are the singular greatest failure of the device. It's the lack of content. Hell, 'lack' feels like an understatement—alike to saying that Nazi Germany was unfriendly towards Poland at the end of the '30s. There are four apps. Four! And one of them (Jaunt VR), hilariously, kept crashing and refused to work no matter how long we waited for it to initialize when it didn't. And then there's the YouTube's VR video channel app, which isn't exclusive to the device. That left us with two unique experiences, including Aquarium, which is you sitting in an aquarium watching animated fish be boring, and Bowling, which has got to be the most low-tech game to be featured on a cutting-edge device. 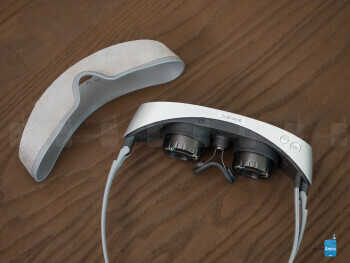 Since the LG 360 VR is linked with your smartphone, it has no need for its own battery. Instead, it drains the one on your phone. 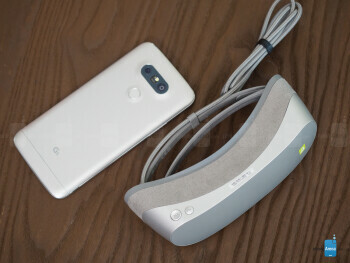 To ensure we're getting the best experience possible, we used an LG G5 for the duration of this review, and the 360 VR gnawed on its battery like crazy. An approximately 20-minute session took the cell from 50% to 15%, which is kind of disappointing given LG's estimate of 2 hours with the G5 in airplane mode. This thing could have cost $50, and we'd still tell you to stay the hell away. At $199, it's an outright money grab that should simply be discontinued. Nothing wrong with that. 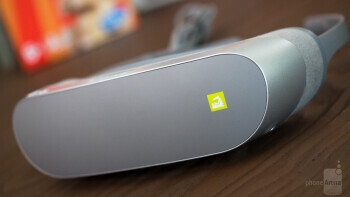 That's kind of sad, because the LG 360 VR introduces some sound ideas. If we had a longer cable so we can safely insert the tethered phone in our pockets, it'd be a sound improvement, as the headset really is much lighter and more compact than competing solutions. Since the phone is not directly on your face, it also doesn't melt your nose off, which is also а plus. Unfortunately, the 'light blocker' is under-engineered, and the eyeglass temples are just... what?! But most importantly, even if all of the above wasn't the case, we'd still consider the 360 VR a gigantic waste of cash, as content for it is simply non-existent beyond YouTube. You can experience better virtual reality with one of them near-disposable Google Cardboard viewers for just $15, or the $99 (or free, bundled with the Galaxy S7/ S7 edge in some regions) Samsung Gear VR. Use the remaining dough to support this guy instead. You'll get more out of it. Thanks to our friends over at MobileFun.co.uk for sending the LG 360 VR in!